Dad taught me a good number of life lessons during my youth. A big one was that if I took care of equipment, it would take care of me. When I bought my first house, he reminded me of that more than once—how it made it possible to save money, stretching it farther, ready for an emergency (or to send three kids through college). I have the best intentions of following recommended maintenance schedules for my equipment. In reality, I routinely drain and refill the oil. A few years later, the first part breaks. I crack open the owner’s manual for the second time. 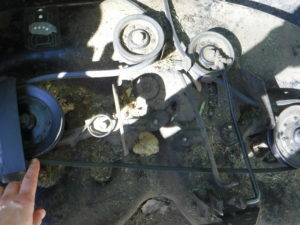 This weekend, it was so I could replace the broken motion drive belt and the mower blade drive belt on my tractor mower. Shifting gears on hills is a no-no. 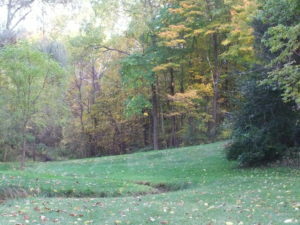 That’s all well and good, if your property doesn’t sit in a ravine, and you don’t own part of the knoll out back. After a few mowings, I figured out how much of an angle didn’t stop me from shifting, though odds were I shortened the life of the belts doing so. Last year, I dropped the drive belt when I was paused too long at the top of the hill by the road, waiting for an inordinately long line of traffic to clear. When I finally let my foot off the brakes, the tractor refused to move. Dang. I stayed in denial a good five or six shifts, but nothing worked. A kind neighbor helped me push the tractor back to my drive so I could work on a safe surface. I lay on the ground, looking up at the underside of the tractor. I’d dropped the belt off a pully. The minimal effort it required to put it back on the pully clued me in that the belt might be stretched, from, oh, say, two years of mowing, and shifting on my several hills. Many times each mowing…. I jumped on sears.com and entered the model number. I figured I’d buy both belts, using the logic that if one was on the way out, both were. I would proactively replace the belts, so I wouldn’t be stranded. Since I’m not big on sharpening mower blades myself, and a few bucks more got me free shipping, I threw in a set of new blades. Everything sat in the garage, waiting for that perfect time to replace them, like maybe over the winter. Especially this last one, which was so mild. If only I had followed Dad’s advice about taking care of my equipment…. Last week, it would have been nice if it hadn’t been fourteen days since the mow before my vacation. It would have been even nicer if the fertilization hadn’t occurred six days before I got back. Even nicer if a good amount of rain hadn’t occurred, activating that fertilizer. I stopped to grab a drink of water, and when I let my foot off the brakes, the tractor refused to move. I threw it in park, prepared to rehang the belt. Instead, I found the frayed end of the belt. For about five minutes, I lingered in that glorious land of Denial. Maybe I could tie some pantyhose to it, thread it through the pulleys, effectively take out the old belt and replace it with my temporary solution. Except the belt wasn’t on two pulleys, and I wasn’t sure how to thread them. Drat. Common sense dragged me out of denial. I pushed the tractor to the shed (which became much easier when I released the parking brake). I sprinted for the garage, calling the power mower into service. Covering all that extra lawn by foot gave me time to plot out the belt replacement. Scratch that, belt and blade replacement, given that I’d have the tractor apart. I didn’t think twice about tackling the jobs, thought I’d never done either. I have to thank Dad for that, another of the valuable lessons he taught. Heck, still teaches me. Mom didn’t set appointments with repairmen to fix the washing machine, dryer, leaking pipes, or anything else that broke. We didn’t drive off to a dealership or garage to fix the car. Nope, we waited for Dad to come home. He diagnosed and repaired the ailing machine, pipe, car. Always. I had his lesson in self-reliance; and in this age of the internet, I had so much more information than he used to have—YouTube Videos; Craftsman guides with tons of photos. On the face of it, neither was a complex task, though disconnecting and reconnecting the mower deck could certainly intimidate me if I let it. If I got in over my head on the repair, then my next challenge would be figuring out how the heck I’d get the tractor mower to someone who could fix it. And mowing an acre with the power mower. Yeah, time to get busy. Cotter pin by cotter pin, I released the joins between the tractor body and the mowing deck. I slipped the mower drive belt off the upper pulley that’s part of the tractor body, so I could slide out the deck and work on the easy belt there. A quick whack with my rubber mallet against the “stabilizer bars,” and the mower deck dropped to the ground, along with the first clumps of grass. To replace the blades, I had to flip over the mower deck. In the absence of having a block of wood to stop the blade from spinning as I cracked the nut free, I pulled out my wooden wheel ramps. Perfect, the blade bit into it, and the ramp wedged perfectly. If only my other two repairs would go as fast and flawlessly. 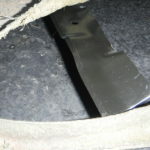 New blades installed, and no detour to an urgent care! With the blades changed out, I flipped the deck over. I snapped pictures of how the unbroken belt was threaded. It had two significant cracks in it. Yeah, that belt wasn’t all that far from breaking, either. I made a few missteps during the first repair, like not being able to crack free the big plastic pulley guard, despite owning the right star-shaped screwdriver. I needed something taller. Every job, I kinda figure I’ll make one run to the big-box store for a tool or part, so I already had this in my “estimate” of repair duration. But even with the adapter so the screwdriver stayed vertical, I couldn’t crack even one of the screws free. Sigh. Time to get creative. I reached my fingers beneath the plastic outer guard. Hmm, an inner guide hid there. Could I thread the belt around the pulley? I got dirtier, unleashing a cuss word now and then. After a few minutes, I must have twisted just right, because the belt slipped onto the pulley. Nothing else fought me. That left the hardest replacement—the one I couldn’t see well, because I’d have to work under the tractor, and the broken belt meant I had those two pulleys I wasn’t sure how to thread. My peach t-shirt turned black as I worked at feeding the new belt through pulleys right after I unthreaded the broken belt. The rear pulley guard couldn’t be unbolted, at least not from underneath, so I unleashed a few more curses, working even more blindly than the first belt, but I stuck with it until I succeeded. When I reached the naked pulleys, I bemoaned that the I’d left my guide on the other side of the tractor. As I crawled out, what did I see on the mower deck but a label depicting the threading! Reattaching things took longer, requiring full daylight the next day. I looked for the clean metal, a ring of dirt—anything that showed me which hole to use, as several of the parts had more than one hole. Rubbed metal showed me that a part slid across the front side, not the back side. Mental note: Take more disassembly pictures, so the next job goes faster! I’d spent several hours on the projects, but I’d done it by myself. Me, a li’l ole girl. Woman. Writer. Whatever. I did it, because Dad is always that movie playing in my head. He taught me to roll up my sleeves and get to work, even when no one has taught me a task. Each success gives me that much more confidence to tackle the next project. What’s a job you’re proud of tackling, though no one taught you how to do it? I’d love to hear your tale. This entry was posted in Life Lessons, Repairs, Uncategorized and tagged Dad, Replacing riding mower belts, Replacing tractor mower belts. Bookmark the permalink.